…for a home birth!! The midwife has just been for a home visit, I’m not sure if we had one of those last time.. She did my blood pressure which is normal and took my blood – which she got first time! She was really nice, very pro home birth which is a bit unusual as most midwives I’ve seen have either been a bit against them or indifferent! She is really into homeopathy as well and recommended what to take during labour. I know my chances are slim but I hope she’s the one on call when I have number 3!! Apparently the head is between 1 and 2 fifths engaged and as of pretty much now she said I am fine to pop and be allowed to stay at home!!! She was also really positive about leaving me to it when I go into labour. It was really nice when Noah was born as there was no-one there and it was all very relaxed, and so she said if I don’t want anyone interfering then just don’t inform them til the last minute, but she also said to not worry about calling them out for false alarms!!! ….at the new house!!!!! So civilised camping!! People that know me will know I hate camping with a passion..I only go once a year on the Avon Park weekend! But Caitlin and Noah were at my Mum and Dad’s last night and we were deciding where to go for tea and a drink…Richard suggested we go out near to the new house, so then I thought why don’t we stay over??? 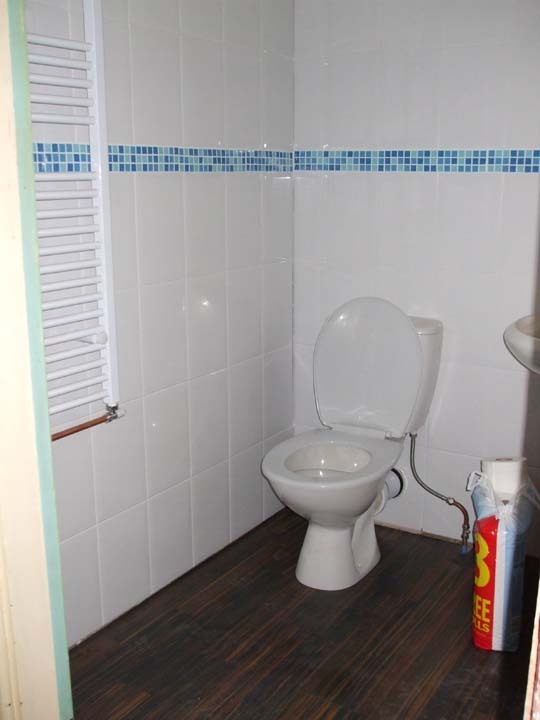 We’ve got 2 decorated rooms, a toilet and a sink – oh and we bought a microwave yesterday so we went for it!! We took our old mattress and some bedding and our toothbrushes and away we went! 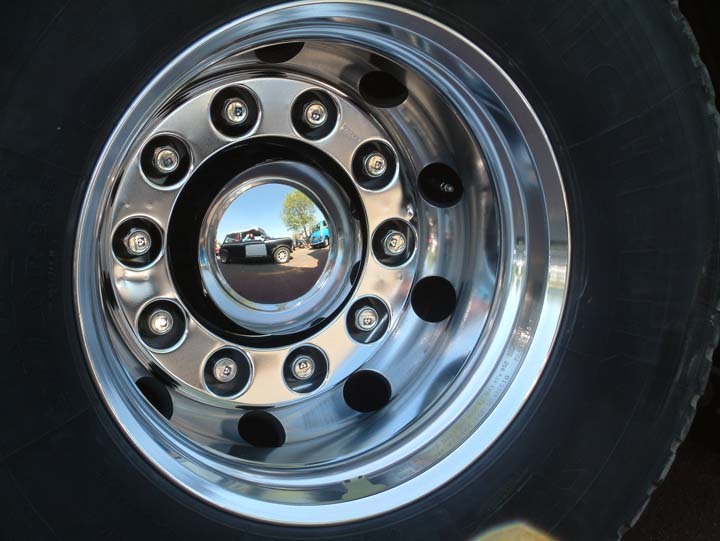 No idea why I suggested staying over really since I can’t drink so could drive us to and from where ever we went out…. Anyway I survived my camping but it wasn’t really fun….the mattress is SO LUMPY!!!! I had forgotten why I kicked up such a fuss to get the new bed before we moved…now I remember!!!!!! Also the ambulances…oh my God they are so noisy! I’m hoping they are going to be like trains in that after a while I won’t notice them…I didn’t notice the trains at the new house so either there weren’t any or they are the same sort of noise at at our current house so were already blocked out for me! But our new house has an ambulance and fire station around the corner…and I noticed those!!!!!!!!! So yeah not really camping but not full home comforts either…. Aside from the bad bed and the ambulances it was a very funny night and I’m sure our new neighbours will be talking about how mad we are today!!! Mary the fairy and Friends!! Today I went to a craft show…it was brilliant!! There were so many bits and bobs there I could have bought all sorts!! But I was very restrained and only bought a mini stamp…I have been looking for a mini stamp for years..they are impossible to come by!! I also got a butterfly template and a chicken template which I am going to make with Caitlin to decorate her bedroom….and also a template set for Mary the Fairy!! She is gorgeous and if I get time to make her and a few friends for her I’ll post pics!! I got to make a butterfly at the show and that was pretty easy so Caitlin should be fine with those, Mary looks quite complicated!! Also at the show (all photo’s stolen from Linda as I didn’t take my camera…Thank you Linda!!) 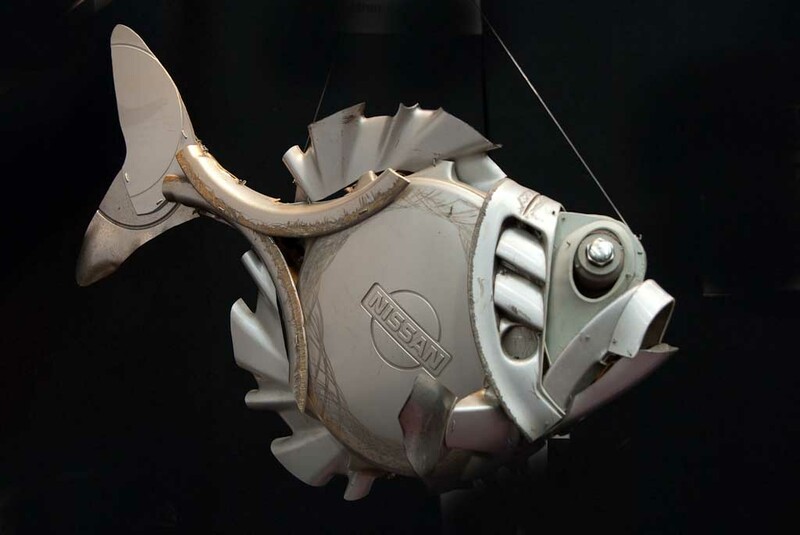 was a display of recycled car parts…. 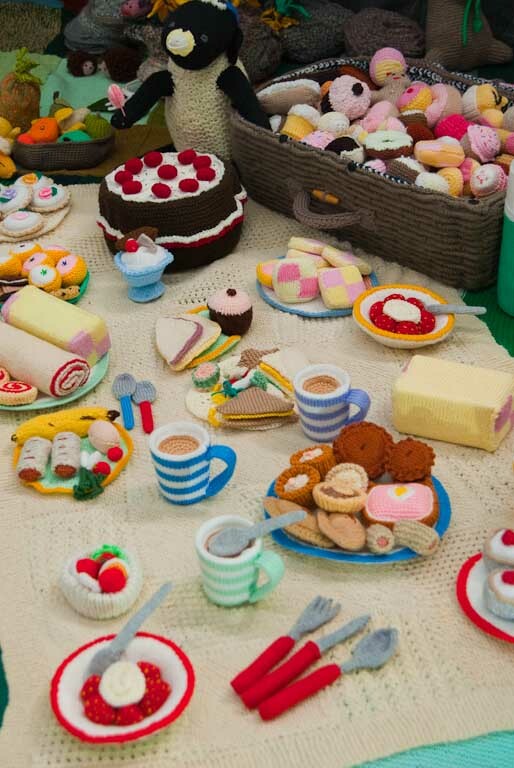 ….and a knitted picnic…I really want to make some of these they look brilliant!!!!!!! I have way too many projects on my wish list!!!!!!!!! Ah well…… There was also a woman knitting on MASSIVE needles which I’d like to have a try at too….just need to get Richard to make me some giant needles!!! This morning we moved our first items into the new house!!!!!!!!! I have to point out that this makes it seem like we are close to done…we’re not its just 2 simple rooms are done and while I have a spare seat in my car (before number 3 claims it) I’m taking bits and bobs there!! So today we took some books and toys…. And then we used our blow up sofa bed to eat lunch!! 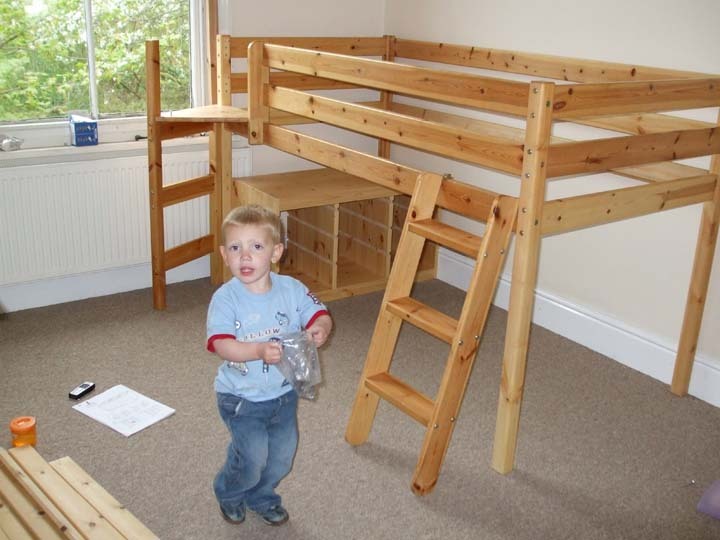 I then also tried to build a set of shelves that my Mum and Dad brought over for us that they had been storing…. Unfortunately we have 3 sets of shelves the same or so I thought…. 2 sets are the same but I had 2 right hand sides to those and no lefts…and the other set has different fixings to hold it together and I thought I had the 2 sets of fixings for the other shelves even though I had all the parts for the 3rd shelves….. So no shelf building!! 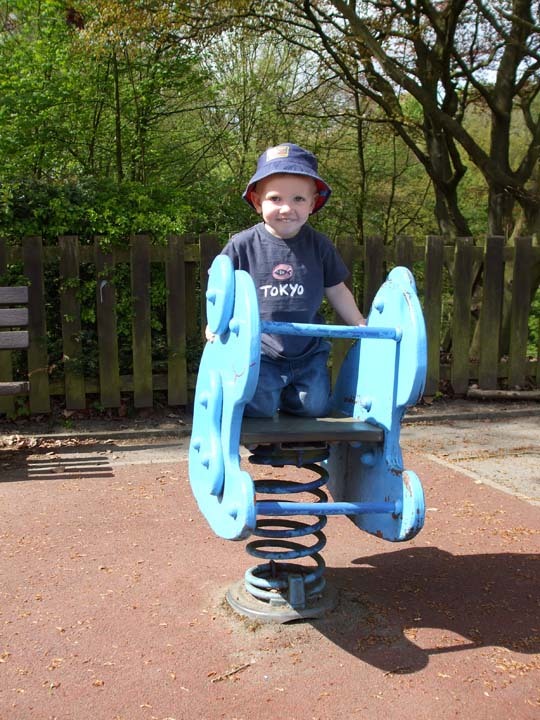 In the afternoon we went to the park to enjoy the sunshine…. Its a park near to the new house which I hadn’t been to before and its really nice…there’s a duck pond, play ground, nice surroundings and a nice old hall…. The ducks are a bit nasty to each other though and while we were there we saw a group of them trying to kill one of the others…they were stopped by a passing bloke kicking them off it!!!!!!!!! After the park we went back to the house to double check the shelves as they were bugging me….and I discovered the odd set out of the 3 did have the fixings with it so I could build that set…. 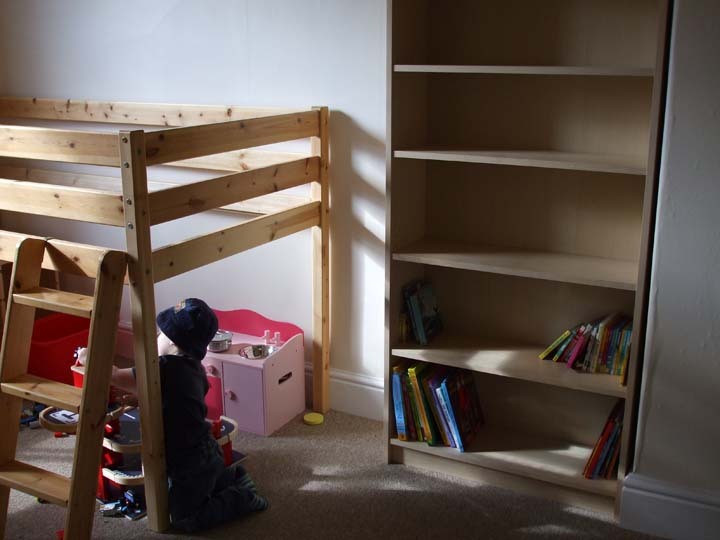 So now their room has some shelves…. 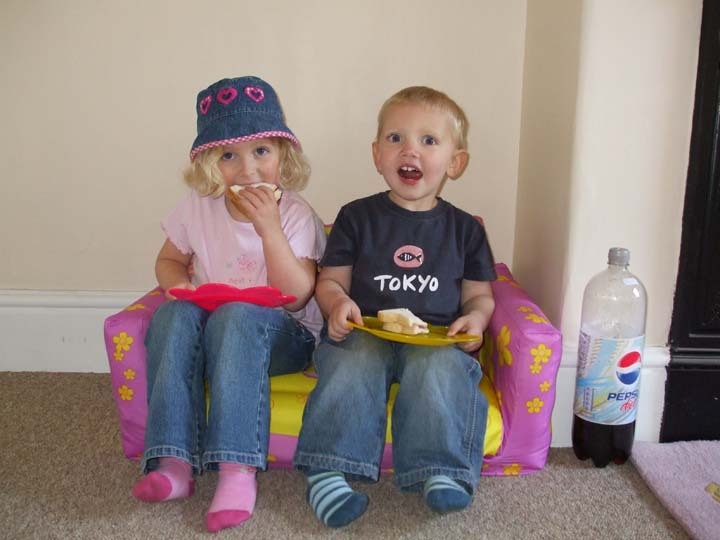 Both Caitlin and Noah had a great time playing with the big box of cars I’d taken and also on Caitlin’s new slide bed…. …I tried to get a photo of Noah but mine was blurry…but Caitlin got a good one…. 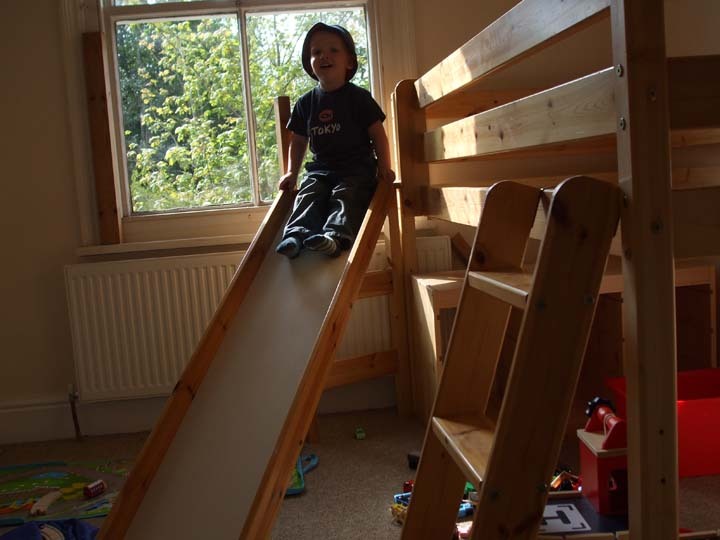 I can see that slide may ruin our fantastic record of never having any trouble getting them both to go to bed and stay in bed!!!!!!!! The bathroom is really coming on…there is running water in the bath and a fully functioning loo!! Which is great since I have no idea how to get Noah to wee outside!! Caitlin I am fine with I just make her do what I would do…but Noah ……its just a disaster!! I either tickle him and so he just laughs or if I hold him flat but facing down he just won’t do anything! No wonder really he probably wonders what on earth I am doing to him!! Luckily he can hold it for ages so there have been no accidents but at least now he can go to the loo when we are at the new house!! 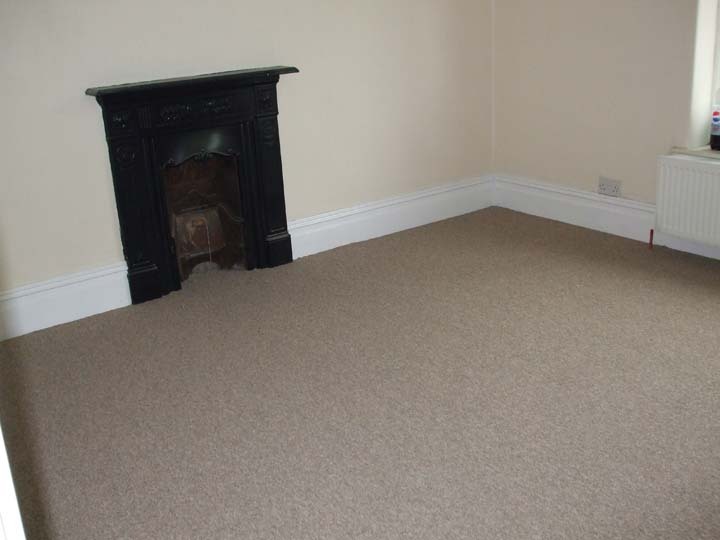 Also today we have had the carpet fitted in two of the bedrooms so I can start moving things in and organising those rooms…. …well carpet!! And a bit too much of it!! We were supposed to be keeping the tiles in front of our fireplace visible but they’re not…. Not sure why just yet as I had to delegate the carpet fitting supervision as I had a midwife appointment….. 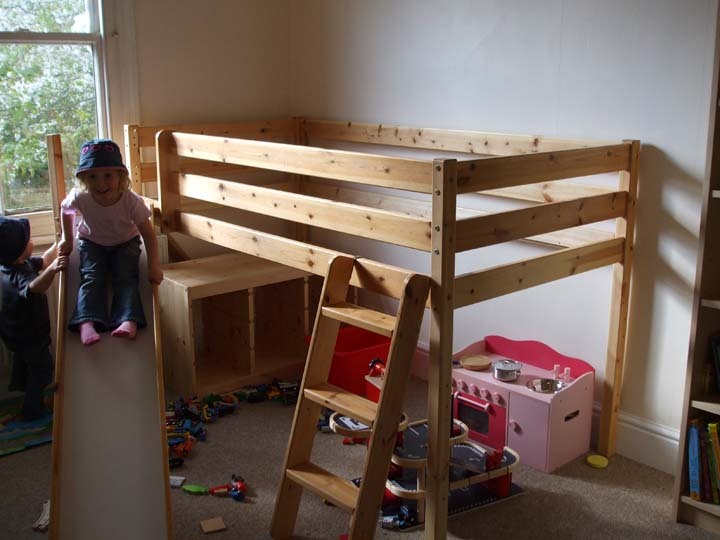 Tomorrow I am hoping to get the shelves built in Caitlin and Noah’s room and then I can bring things to put on them and some toys that will be stored/played with under the bed!! As for my midwife appointment it was as usual very uneventful aside from the fact I forgot my notes and since a lot of the check up is checking nothing has changed since last time she couldn’t really do it but had to rely on the fact I told her my BP etc was normal…. 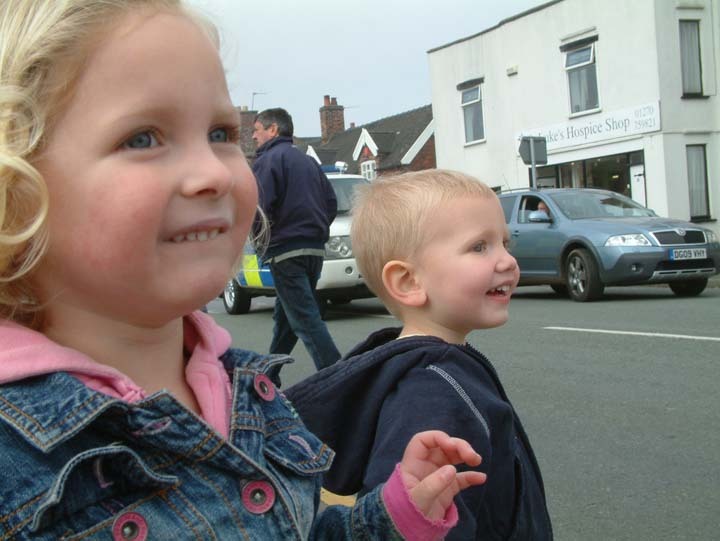 We don’t want to totally brainwash Caitlin and Noah (honest!! 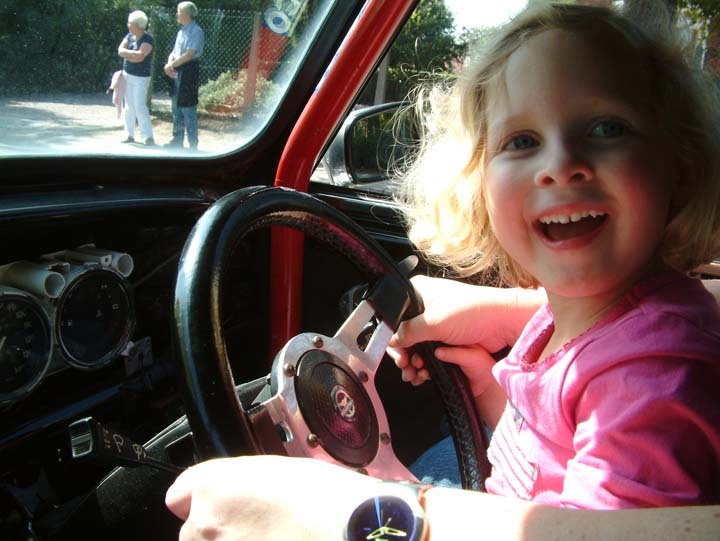 )…so today we’ve been to a general transport show!! It’s for all types of transport from steam engines to motorbikes to modern cars (although there are very few modern cars really thank God!!) 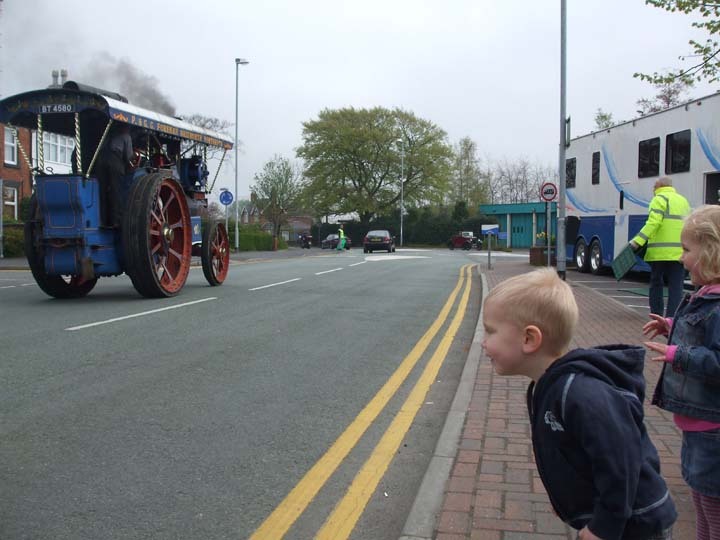 We went with the mini club and Noah and Caitlin were both fascinated by the steam engines…. ….its so hard though to get their expressions and the thing they are looking at all in one shot!! 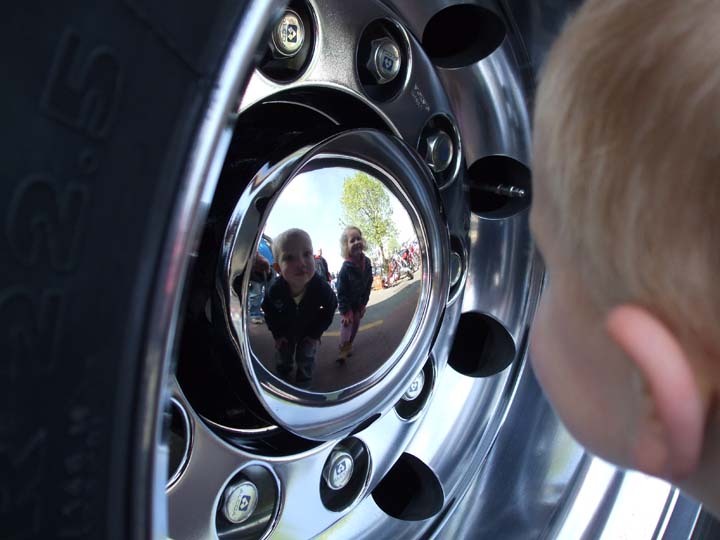 There were also articulated lorries there, they were a couple of years old but polished to death as we could take photo’s in their wheels…..
Noah was convinced the wheels were mirrors and stayed looking in them for ages!…. 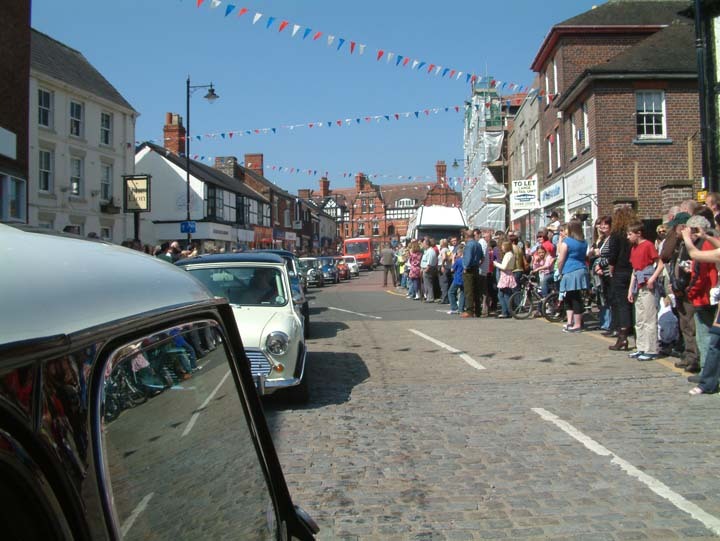 Half way through the day was a parade of all the vehicles and the mini’s were really close to the front. We did a circuit of about 2 miles but as the steam engines were at the front it took us an hour!!! As we were going so slowly I let Caitlin help me drive!! I chose the exact moment we passed loads of police standing at a junction making sure the traffic had stopped for us but they didn’t seem to mind that she was sitting with me which was lucky!! So that’s now three whole days we’ve spent away from the house so it’ll be back to it for both of us tomorrow since we need to make sure the 2 bedrooms are clear and floors clean ready for the carpets on Tuesday!!!!!! !